Polar Plunge January 5th 11am – Kennebunk Beach’s Polar Plunge is a chilly annual chilly tradition, at Gooch’s Beach at 11am January 1. New Year’s day ocean dippers donate to charity to take the polar plunge, so it’s called “Freezin for a Reason”. February is for Lovers and Paint the Town Red Specials in Kennebunkport – New England’s most romantic town, with Frozen ice bar parties, Avalanche at Old Vines Wine Bar, cocktail classes, sushi making and oyster shucking demos, and romantic wine dinners at Kennebunks’ best restaurants. Escape for a weekend away from home, enjoying good food, quiet times and the warmth of a romantic fire. 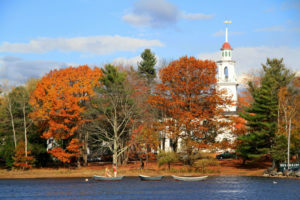 Kennebunk-Kennebunkport offers the perfect winter destination, fine lodgings offer you unique romantic getaway packages. Cozy and intimate restaurants, quaint shops and unique galleries all set in a picturesque stunningly romantic village setting. Red plate specials and red tag sales! February 9 – Winterfest in Kennebunk – Winter carnival activities, All Day Skating at the Waterhouse Center Ice Rink, Horse & Wagon Rides, Fire Juggling, Figure Skating Performances, Music, Chef Tasting Contest, and the Annual Cabin Fever Book Sale at the Library! March 1 – 12, 2019 – Maine Restaurant Week – Maine Restaurant Week events highlight the food and drink professionals who set Maine’s restaurant scene apart. For the sixth straight winter, top chefs and bartenders will compete for the “Best of Maine” title at MRW’s Incredible Breakfast kick-off event and Signature Cocktail and Dessert finale event. Tickets and deatils for these events, as well as the 2016 versions of our popular Pancake Race and Chef-Am Bowling Tournament, will be announced soon. Maine Maple Sunday is always the fourth Sunday in March – The Maine Maple Producers Association welcomes you to join Maine’s Maple Syrup Producers, statewide, as they celebrate Maine Maple Sunday. Most sugarhouses offer free maple syrup samples and demonstrations on how pure Maine maple syrup is made. Many farms offer games, activities, treats, sugarbush tours, music, and so much more. 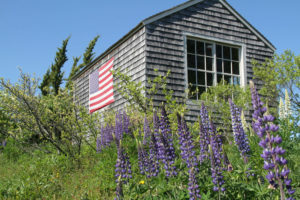 Annual May Day Festival– Kennebunk – Saturday May 4 – Popular, family-oriented activities and some fun, new additions. Local artists/crafters, community organizations, and antiques enthusiasts. 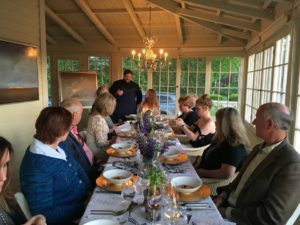 An early summer fine food, art and wine festival celebrating the spectacular creativity and hospitality of Kennebunkport and Southern Maine’s artists and art galleries, chefs and distillers, with private dinners, parties, gallery openings, and live music throughout town for the week. June 8 – Barbara Bush’s Birthday – First Lady Barbara Pierce, also known locally as Ganny, was born in 1925, passed April 17 2018. She is missed. Visit White Columns First Family Legacy Exhibit for memories. June 12 – President George Herbert Walker Bush’s Birthday, known locally as #41 was born 1924, passed 11/30/18. 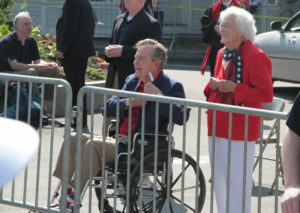 Kennebunkport was his “Anchor to Windward”. The Kennebunks kick off summer with the 4th annual LAUNCH! LAUNCH highlights seafaring facets through various anchor events and activities; a “Captain’s Cook-Off,” an authentic Lobster Bake with red and white checked table cloths at the Pilot House, overlooking the Kennebunk River; and the highlight River Lights Boat Parade where local boats are decked out in their finest, and a VIP “Rock the Boat” adults-only evening event. Launch concludes with a Blessing of the Fleet at Cape Porpoise on Sunday morning. A day of golf and fundraising begins with a evening gala at Hiddden Pond. Celebrities and sports stars, Tom Brady, President Bill Clinton, Jim Nance, show up for this 21st annual fundraiser Golf Tournament on Tuesday at Cape Arundel Golf Club, River Road Kennebukport. 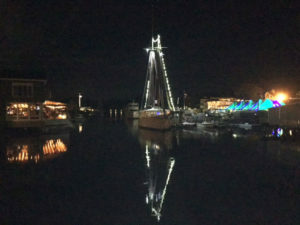 Art Walk in Kennebunk and Kennebunkport- 2nd Friday Art Walks – June to September, and a special Prelude Art Walk 2nd weekend of December, visit 30 art galleries and studios on Friday evening 5-7 for drinks, bites and beautiful artwork, photography and local Maine sculpture and crafts. 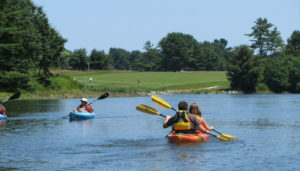 Aug TBD Nonantum Annual Paddle Battle – a fun river race for canoe, kayak, Sup and Surfers, with a 1.7 mile course on the Kennebunk River, and a party at Nonantum Resort. Read all about Kennebunkport’s Paddle Battle. Sept 24 – 10am – Punkinfiddle at Wells Reserve at Laudholm – A National Estuaries Day Celebration and fall craft festival. Merchants throughout Kennebunk and Kennebunkport hand out goodies to the little ghosts, pirates, princesses. Summer Street is spooky, decorated devilishly with haunted mansions. 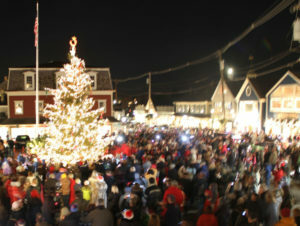 A magical season filled with events, entertainment, shopping, craft fairs, and Santa in a lobster boat!